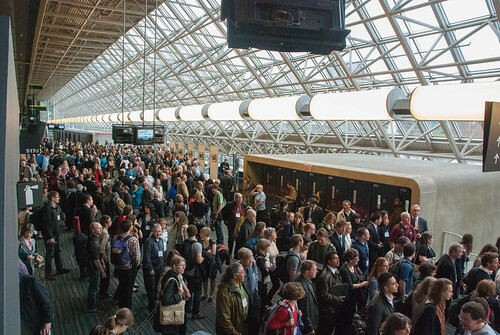 This week the polar community is taking over Montreal for the International Polar Year (IPY) Conference. 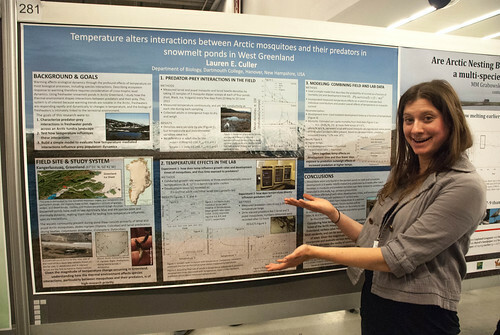 Since the Dartmouth Polar Environmental Change IGERT was born out of an IPY project in 2007, it seems fitting that a number of IGERT students are up here to present their research. Moving from learning and researching to presenting and sharing their knowledge, just as the IPY Montreal theme, From Knowledge to Action, promotes. 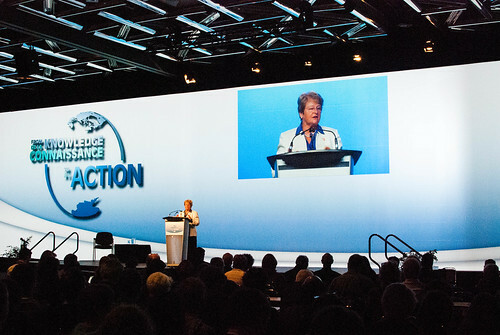 Yesterday morning the conference started off with a bang with an opening keynote address by Dr. Gro Harlem Brundtland, member of the UN Secretary General’s High Level Panel on Global Sustainability and former Prime Minister of Norway. Dr. Brundtland’s work in the 1980’s, with the Brundtland Commission, laid the foundations for the today’s model of sustainable development. She opened the conference by placing an emphasis on the role of science in sustainability and the importance of the polar research in finding solutions for the rest of the world. And on that note students rushed off in all direction to various talks and sessions relating to their particular interests, ranging from polar ocean dynamics to human health and well-being to communicating polar science. 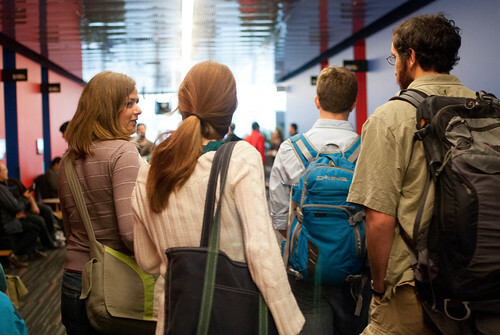 We’ve got a busy week ahead, including poster presentations and talks by Alex Lauder, Julia Bradley-Cook, Laura Levy, Ben Kopec, Rebecca Williams, Lauren Culler and, last but not least, our intrepid leader, Dr. Ross Virginia. 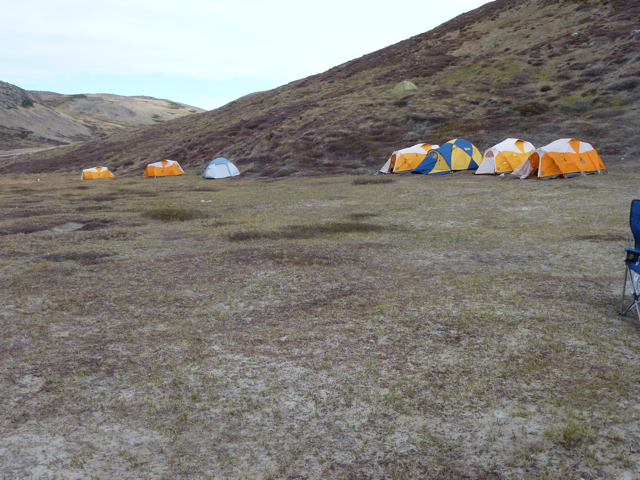 The 2011 IGERT cohort spent one week camping outside of Kangerlussuaq in the same site the 2010 cohort chose last year. The first things we noticed upon arriving at our campsite were the incredible views of the Russell glacier, the Little Ice Age moraine, and the glacial meltwater lakes. 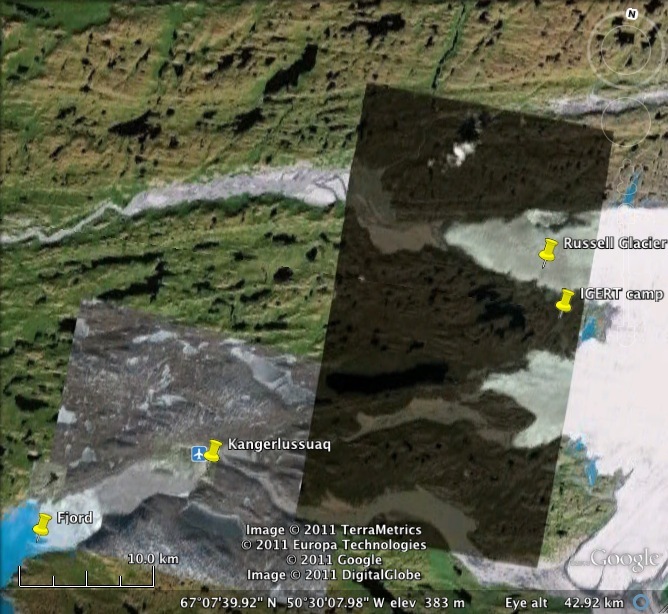 Google map of the area between the IGERT camp near the Russell glacier and the Kangerlussuaq fjord. Air temperatures drop as you drive up the road from Kangerlussuaq to the IGERT camp and the glacier, perhaps offering a gradient useful for studying climate change and insect outbreaks. But as a close second we noticed that the woody shrubs at the site were all leafless and brown, and that there were many large Lepidoptera larvae (caterpillars) roaming in search of food. This place had experienced a recent caterpillar outbreak. The larvae that were left had no more food to eat, and they crawled up our tents and boots or into any warm microclimate. Northern wheatears and snow buntings came in to camp to eat this easy prey off the tents. Adult moths also flew around in large numbers and we picked them out of our hair and our coffee. 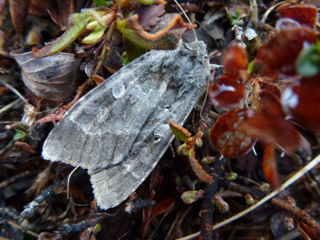 We identified this Lepidoptera species as Eurois occulta, the Great Gray Dart moth known to defoliate the dwarf birch and grayleaf willow common in Greenland. Caterpillars ate all of the birch and willow leaves around camp, leaving a brown world. However, the entire landscape was not brown. 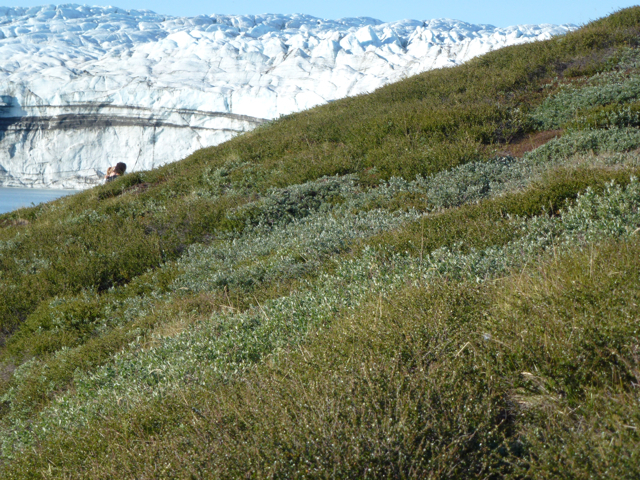 Many hillsides with similar aspect and distance from the glacier experienced only moderate levels of herbivory and remained green. Farther from the glacier, back toward Kangerlussuaq and the fjord, the brown outbreak patches disappeared. Acting on a hot tip from Mike Avery, a PhD student in Eric Post’s lab at Penn State University, we searched for evidence that caterpillars were attacked by a pathogen – desiccated caterpillar corpses draped in the willow leaves. 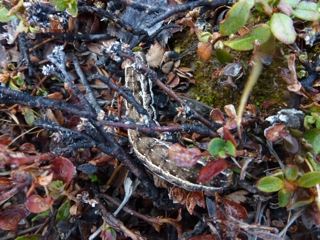 We found many of these corpses in non-outbreak areas farther from the glacier but did not see any close to the glacier where air temperatures are much cooler. Some nearby hillsides, however, suffered only slight defoliation. Closeup of moderate levels of herbivory. Carcass of a larva infected by a pathogen. Why are some hillsides completely brown while others remain green? This is a big question in ecology, and one possible answer is that caterpillars in defoliated areas lack “top-down” controls by predators such as birds, other arthropods, and pathogens. The caterpillar immune system can fight off infection by pathogens (fungal or viral) but this defense requires a high protein diet. In plants much of this protein is RuBisCO, a nitrogen-rich enzyme essential for photosynthesis, and the protein content of leaves is expected to decrease as air temperatures get warmer and the growing season gets longer. 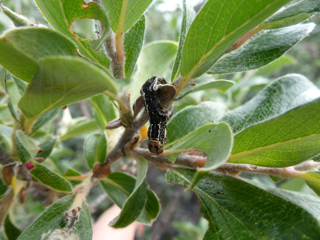 Perhaps caterpillars farther from the glacier had less resistance to pathogens because of lower protein content of leaves, or perhaps there are more natural enemies such as birds or arthropods in warmer areas. 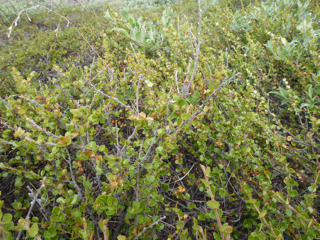 The birch/willow shrub tundra of West Greenland is a great ecosystem to test competing explanations for why insect herbivores sometimes outbreak and how climate change may alter the frequency and intensity of these outbreaks. With the greatest effects of climate change expected to be seen in the Arctic, we will likely see major changes in the hydrologic cycle. The lakes in the Kangerlussuaq region of Greenland have unique ecosystems and, because of their great number, play an important role in the surface albedo and local climate of the region. These lakes are already changing in size and future expansion or contraction of the lake area may result in significant changes in the local water balance, surface albedo, and ecological processes. In order to predict the future changes of these lakes, such as changes in volume, chemical compositions, or ecological processes, we first need to understand the water balance of these lakes and the hydrologic cycle of this region. 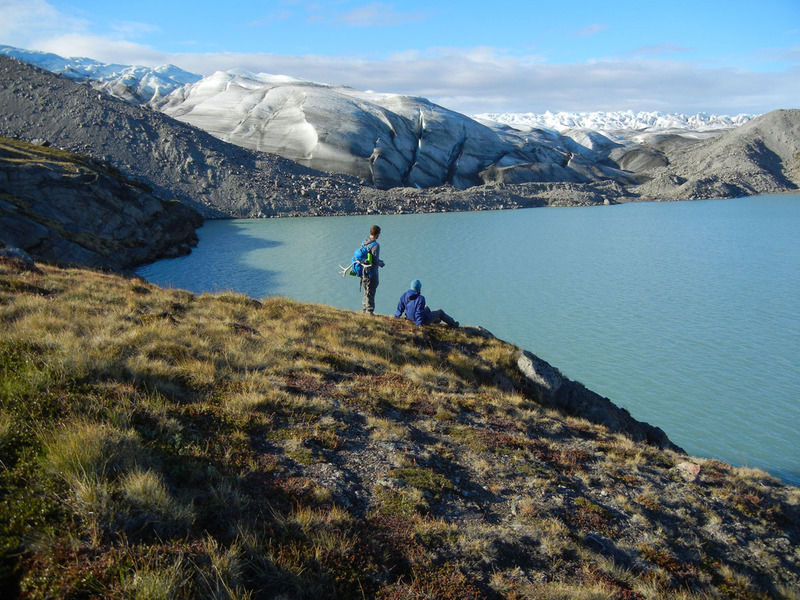 There are two main types of lakes around Kangerlussuaq which have different hydrologic regimes. Most of the lakes receive water from precipitation only and because they are in closed basins, lose water primarily through evaporation. 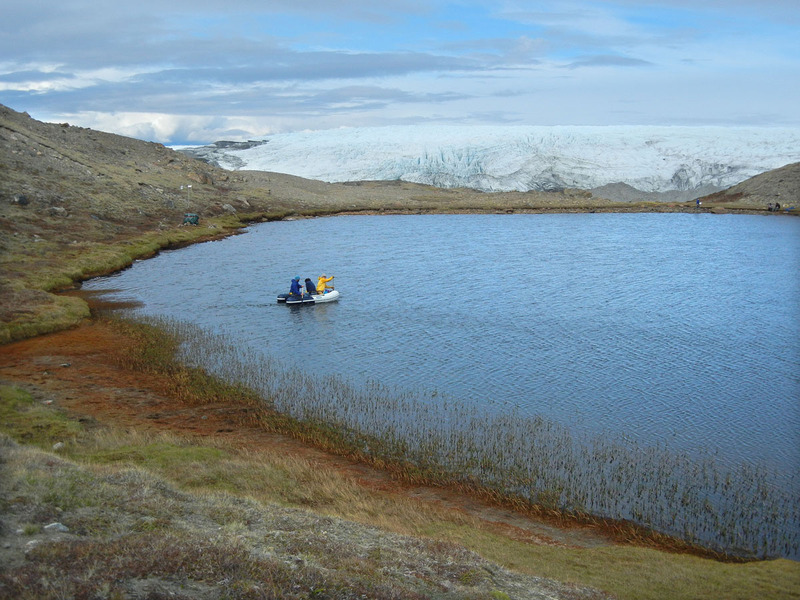 The other type of lake is located near the ice sheet and differs from the others by receiving the primary input of water from melting ice, with precipitation playing a lesser role. These inputs and outputs of water are going to be changing as climate change progresses so it is important to understand the current hydrologic cycle before these major shifts occur. 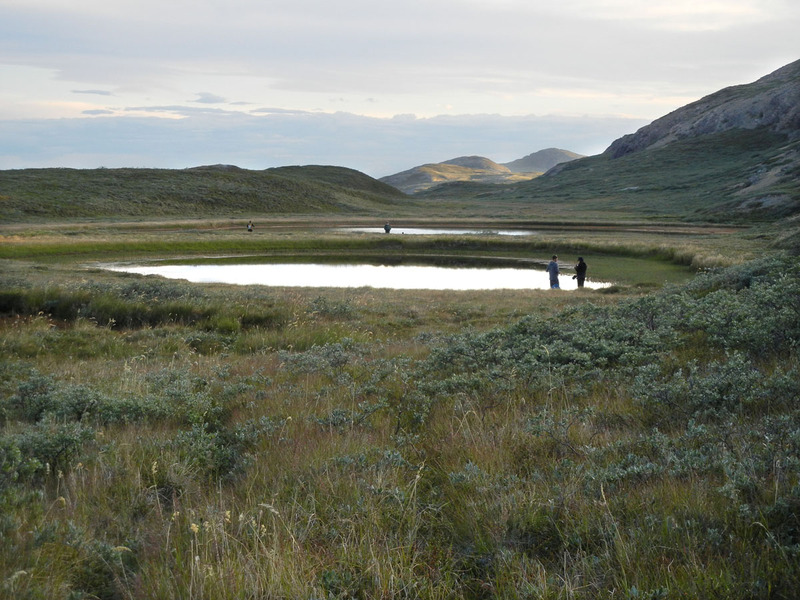 In order to quantify these components of the hydrologic cycle, our group conducted a series of studies on a number of lakes in the Kangerlussuaq region. 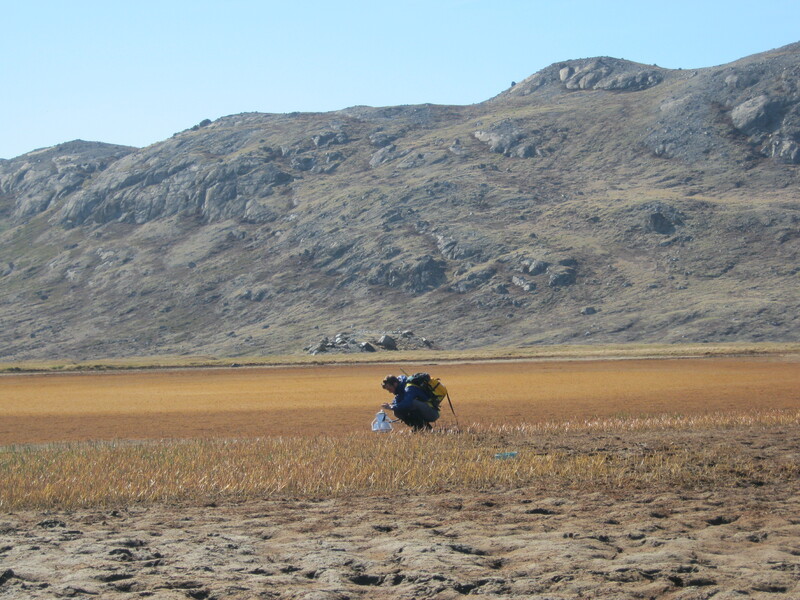 One of the primary efforts was to collect water samples to be measured for their isotopic composition as the isotopes of water are powerful tools that are used as tracers to understand hydrologic cycle dynamics. In addition, samples were taken to measure the water chemistry, determined the depth of lakes from our boat, identified if lakes were stratified or not, and we used a YSI multiprobe to measure various properties of the water that included temperature, pH, and conductivity. From these measurements, a series of mass balance relationships will be used to best determine the rates of inputs and outputs to these lakes to define a starting point in order to predict future changes. A metal cylinder protrudes from the Greenland Ice Sheet. An IGERT photo opportunity? Absolutely, considering this metal cylinder changed how humanity views its production of CO2, nitrous oxide, sulfuric and nitric acids, CFC’s and other “greenhouse” gases (U. New Hampshire). 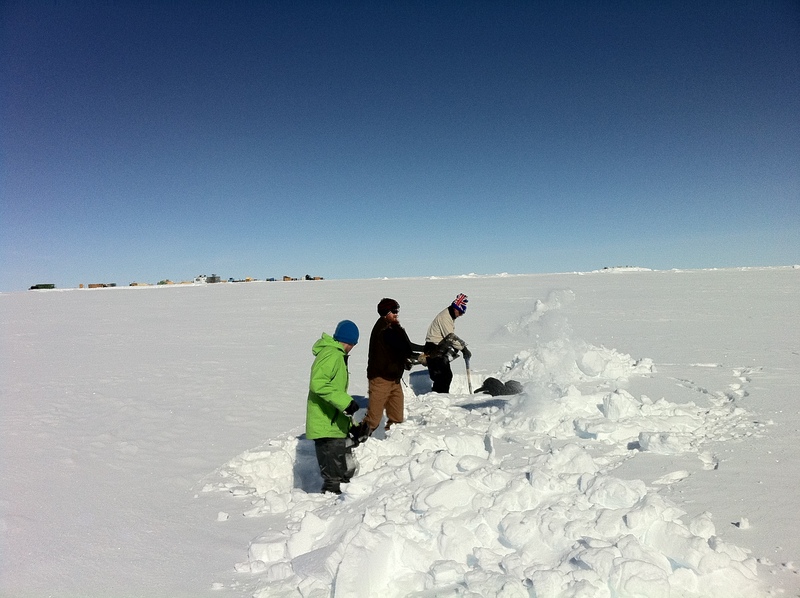 Prior to being a year-round research station, Summit Camp was the drilling site of the Greenland Ice Coring Project (GISP2). Drilled from 1989—1993, GISP2 is the deepest (3053.44 meters) and longest ice core record (>100,000 years) in the northern hemisphere. In total, forty-two types of measurements composed the GISP2 deep drilling effort. The borehole, what remains after the conclusion of drilling, is filled with a fluid that keeps the borehole stable/open. The borehole can then be monitored via temperature-logging. The current metal casing may be in need of repair in order to keep the borehole available for future logging. Hopefully the National Science Foundation can find a way to maintain the GISP2 borehole, keeping the historic ice core borehole available for future measurements. 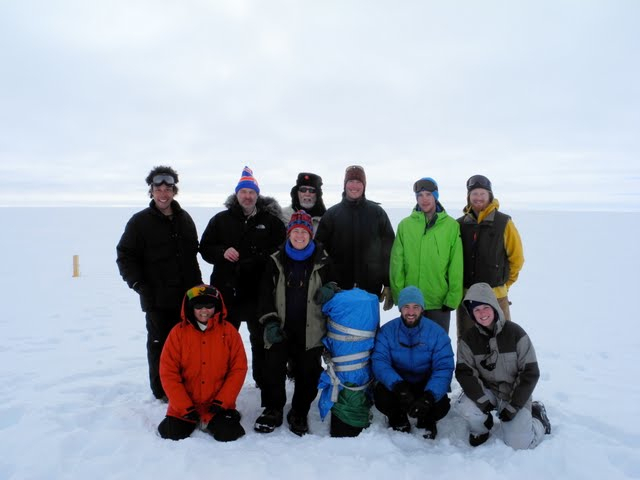 The iisPACS group (Isotopic Investigation of Sea-ice and Precipitation in the Arctic Climate System), led by Xiahong Feng and Eric Posmentier of Dartmouth College, and John Burkhart of the Norwegian Institute for Air Research. The group is researching how sea ice extent affects sea surface evaporation and land precipitation in Arctic regions, and how this effect impacts the Arctic Climate System. In order to attempt to answer this question, we precipitation samples will be collected at various sites across the Arctic and measure the oxygen and hydrogen isotopic composition of the water. These isotopic measurements will be combined with weather information, sea ice satellite observations, and numerical models to quantify how the amount of land precipitation is regulated by sea ice extent. One of the new stations we are setting up is located at Summit. With all precipitation falling as snow in this extreme environment, a challenge is presented in collecting these samples by only collecting the falling snow and not blowing snow, along with the sampler being able to withstand the adverse weather conditions. Our research assistant, Anthony Faiia, designed a snow sampler that will help to eliminate these challenges. 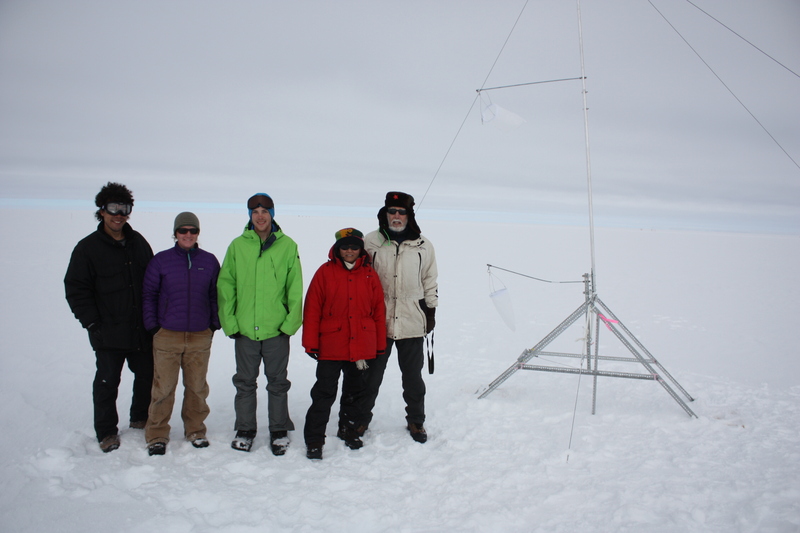 While at Summit, we helped set up the sampler and solved any issues. Let the snow sampling begin! In case you’ve been living under a rock or on top of an ice sheet, Fukushima radiation, refers to the release of nuclear radiation from the Fukushima I Nuclear Power Plant in Japan starting on March 11, 2011. The release of radiation was caused by one of the world’s largest ever recorded earthquakes, a 9.0 magnitude, that struck off the east coast of Japan. The earthquake created a large tsunami up to 133 ft in parts of Japan. The combination of the huge amount of shaking and the inundation and power of the tsunami wave lead to the eventual meltdown of 3 of 6 reactors at Fukushima I and the release of large amounts of radiation from the power plant (See Wikipedia and the NY Times). So what does Fukushima have to do with Summit, Greenland? Ice core scientists use atmospheric events such as major volcanic eruptions to confirm the age of ice cores at specific depths. Beta radiation from upper atmosphere nuclear weapon testing during the 1950s and 1960s appear in Greenland ice cores (one such core was drilled right here at Summit, GISP2). Will radiation from the Fukushima disaster be deposited in the snowfall of central Greenland? Dartmouth’s own Erich Osterberg, Research Assistant Professor in Dartmouth College’s Earth Sciences Department, was recently awarded a NSF Rapid Research and Response (RAPID) grant to study the impacts of the Fukushima Nuclear power plant disaster. IGERT student here at Summit Camp are assisting with the collection of snow, which will eventually be tested for the presence of cesium, Cs137. What evidence is there that radiation from Japan got all the way to Summit? After the Fukushima disaster began, air masses (possibly containing radiation) from multiple different elevations (red=low, blue=medium, green=high) moved eastward over Greenland, between 2 and 3 weeks after the disaster started according to two different sets of meterological data available from NOAA’s Air Resources Laboratory and their HYSPLIT model. Now that we know what Fukushima is, what is has to do with the Greenland Ice sheet, and how it got here, lets talk about how we collected samples to test if radiation from Fukushima actually accumulated in detectable amounts in the snow pack. 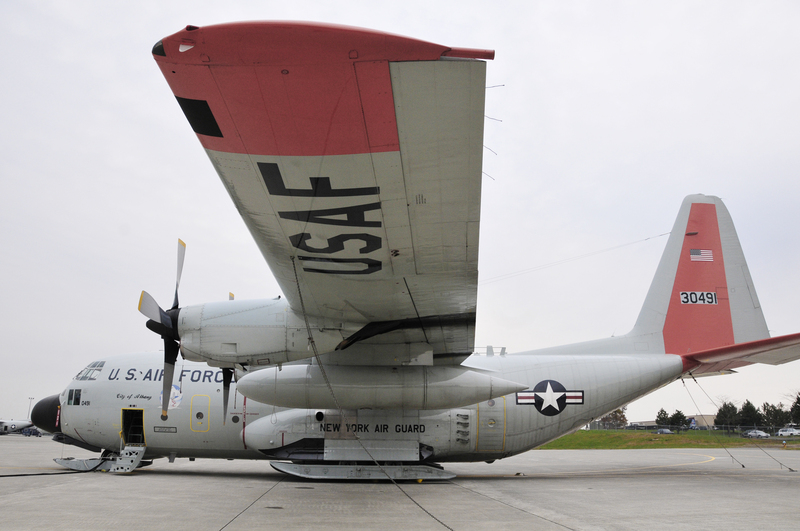 First we shipped three huge ice core boxes full of 45 4L Nalgene bottles from Hanover, NH all the way to Summit with the 109th Air National Guard unit. Additionally, Thomas Overly, one of the IGERTs who recently completed the 1500km traverse from Thule, Greenland to Summit and back again in May and June had left smaller sampling bottles for us to use for the first sampling procedure. 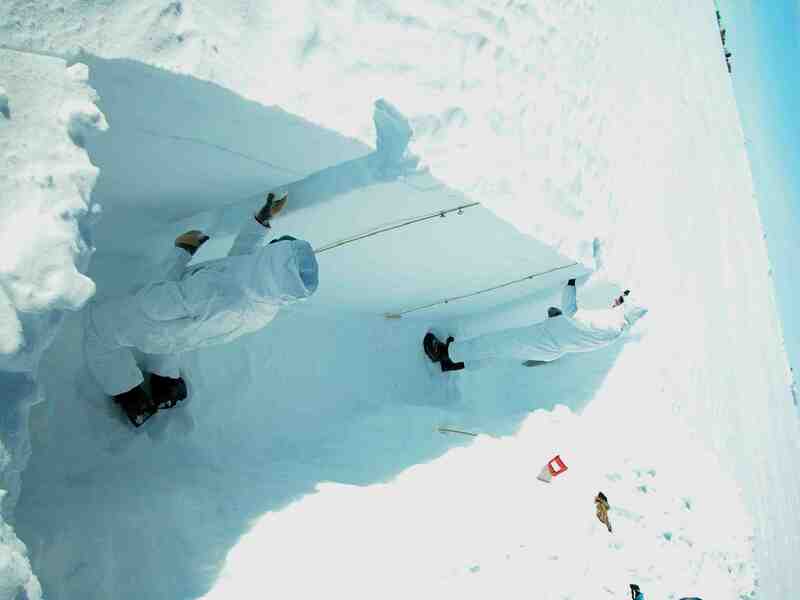 The next step was to dig a huge snow pit (7m long x 2m deep x 1.5 m wide – shown below), which contained two of the sampling locations, and one other pit ~100m away (2m long x 2m deep x 1.5m wide), containing the third replicate. Once the pit was dug, we had the immense pleasure of donning white clean suits and gloves (so as not to contaminate the samples – see Sam and I below) – and transforming into snow umpa lumpas. And FYI wearing straight white was freezing – super high albedo. Two sampling procedures were conducted at each site. 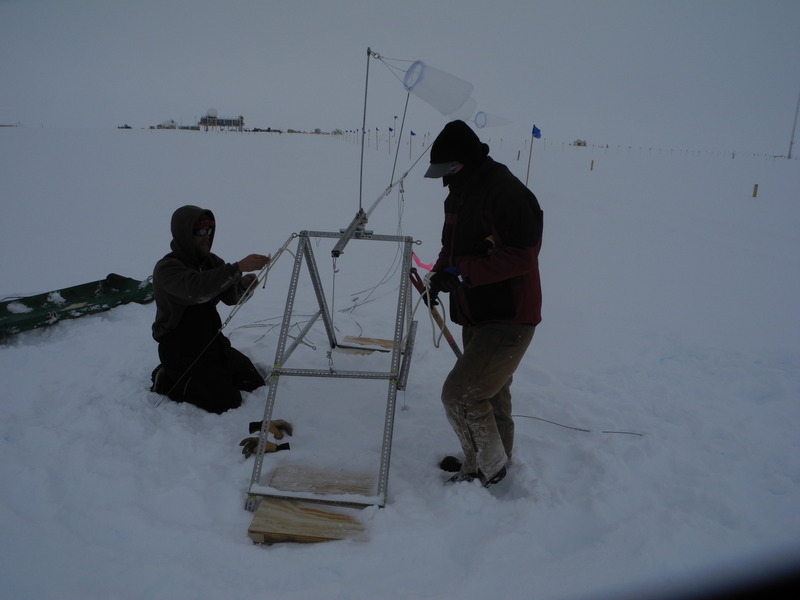 The first set of samples was for isotopes and anions; 125mL of snow was sampled once from each 5cm layer from the surface to 1m depth (see Sam and I in action below). Next we used the 4L nalgenes to sample each 10cm layer three times from the surface to 50cm. In addition to sampling once with the 4Ls, we brought the bottles inside, put them into the sink (we were on dish duty so it was no big deal), and melted the snow in bottles. We then consolidated the water from the different 10cm increments and different sampling locations into one of the three bottles. Once we had two empty containers for each 10cm increment we went back out to the pits and resampled the layers, so as to increase our total amount of water collected. The huge amounts of water from each layer and pit was needed so as to detect the very low levels of radiation, which may or may not be present in the snow at Summit. You may ask why we only sampled the top 50cm with the 4L bottles – well the answer is that the annual precipitation at Summit is approximately 60cm, therefore sampling the top 50cm is more than enough to capture the precipitation that may contain the radioactive fallout from Fukushima. Overall the sampling for Fukushima was a huge success. In addition to our sampling for radioactive fallout, we observed the stratigraphy of the first ~2m, took a firn sample, and conducted permeability and density tests. Stay tuned for the results of this work. IGERT Cohort #2 Ready to GO! IGERT Cohort #2, consisting of Sam, Nina, Ben, Alex, Thomas, and Me are packed and ready to go to Greenland for 4 weeks. We figured out the cargo tracking system (CTS) of the National Guard and CH2MHill’s Polar Services and delivered our cargo to NY two weeks ago. 5am on the 17th our adventure begins on this beast as we travel thousands of miles away from the heat wave of North America to Kangerlussuaq, Greenland. Kangerlussuaq means “big fjord” in Greenlandic and the American’s call it Kanger. So far I hear 65 and sunny in Kanger, can’t wait! P.S> this is my first ever blog post!